The Rustic is a skittish and active butterfly. Very often, when it is encountered - usually in the forested areas of the nature reserves, it is actively flying around and is difficult to shoot. Even when it is feeding at flowers, it tends to continuously flap its wings and twist and turn, making it a species that is challenging to get a good shot of. There are times when it is observed to puddle at sandy streambanks or forest paths. There are also occasions where it comes down to puddle on a sweaty backpack or towel (it is partial to human sweat! ), giving a photographer a much better chance to get a good shot of it. 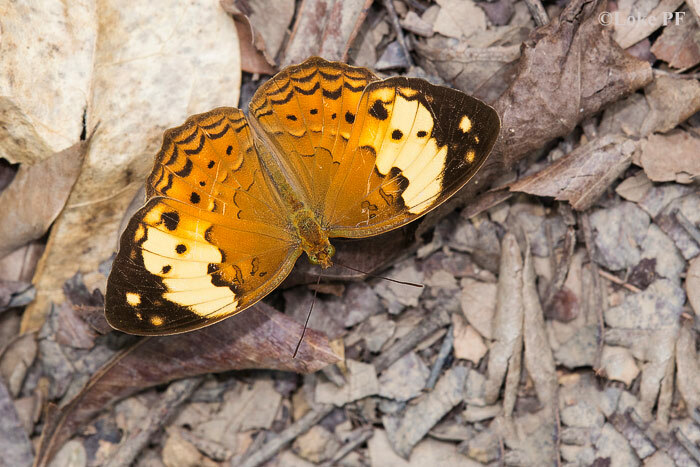 This individual, shot by ButterflyCircle member Loke PF, was puddling on some forest litter.